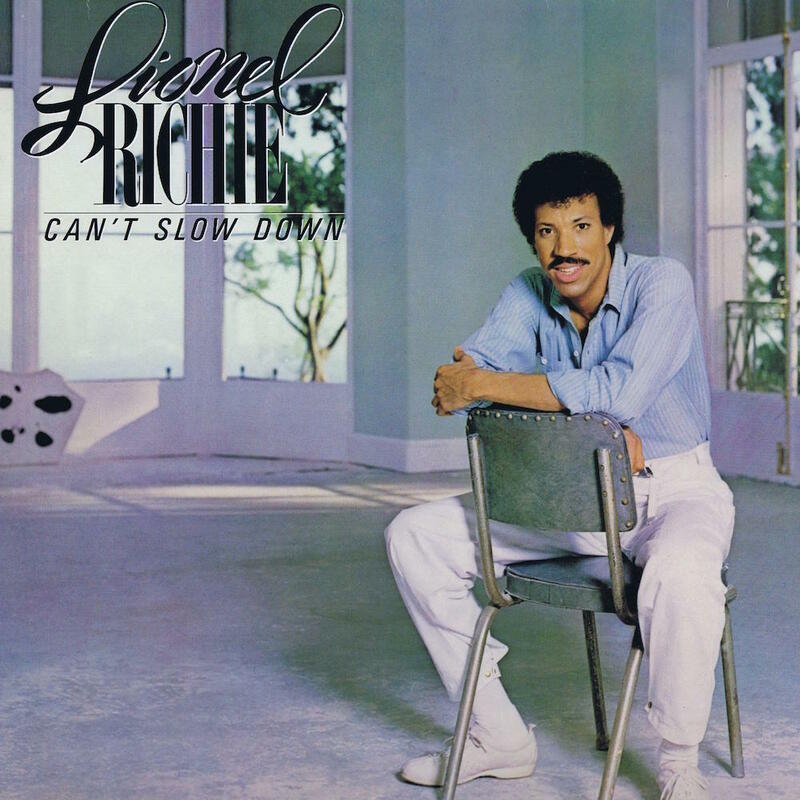 Today’s POP RESCUE from a fate unknown, is the 1983 hit second album Can’t Slow Down by Lionel Richie. This 8 track LP opens with the title track Can’t Slow Down, which is ushered in by some bassy synths and a guitar before those smooth tones of Lionel claim ‘I know what’s on your mind’. A gentle introduction brings in the huge hit All Night Long (All Night). There’s little that’s needed to say about this classic song. Lionel’s vocals are perfect, along with the backing vocalists, percussion and strings. It is simply brilliant, and builds up and up perfectly to the party section of the song. Thankfully, and without surprise, this song was the lead single from the album, and it gave him his second highest ever UK single – sitting at #2. Penny Lover is a warm, slow, soulful ballad, written with his then-wife Brenda Harvey-Richie (credited here as a Production Assistant). There’s some wonderful strings in this track, alongside Lionel’s rich vocals. This song was the fifth and final song to be released as a single, and was released almost a year after the album. Closing side one is Stuck On You. Surprisingly, this song sounds a little like a country music ballad, but it still works. The song was the fourth single to be released. Lionel would return to country music in 2012 for his tenth album Tuskegee – all duets with country stars. Side Two opens with the smooth beat, tinkling piano and keyboard of Love Will Find A Way. Lionel’s vocals here are strong, the lyrics up-beat and reassuring, and the music is crisp and clear – giving plenty of space for each instrument and some well-placed hand claps. Wonderful track. The Only One is a strings-laden 80s ballad, but one that really gives Lionel plenty of range for his vocals. It reminds me a bit of Stuck On You, as well as the 1979 hit After The Love Has Gone by Earth, Wind & Fire. Up next is Running With The Night with its great thumping beat. This is feels like quite a disco/funk fuelled track. The bassline is delicious here. Lionel’s vocals sit perfectly here alongside the music. I really can’t fault this track at all. The album closes with third single and the biggest Lionel Richie UK hit, his only UK #1 to date – Hello. It must be impossible for anyone to not recognise this song – even if they simply recognise it being murdered at karaoke. Even the video is a classic (if perhaps a bit creepy in a student/teacher romance way). Amusingly, throughout the sleeve notes are credits to Calvin Harris… but not THAT one (he was born the year after), and the sleeve notes also give Richard Marx a number of backing vocal credits throughout – he would eventually go on to have his own solo career a few years later. Where is Lionel Richie now? Lionel Richie won a Grammy for Album Of The Year with this album in 1984. The legacy of this album is huge, and has no doubt contributed to his huge continued career success around the world. A 20th Anniversary edition was released in 2003, featuring a number of mixes and demos from the album sessions. Lionel has continued to release albums and fill stadiums with sell-out tours, and has won a Golden Globe and an Oscar for his work. POP RESCUE COST: £2.00 from Hunts Antiques store in Huntingdon. Posted in 1980s, Lionel Richie, Richard MarxTagged 1983, album, All Night Long (All Night), Brenda Harvey-Richie, Calvin Harris, Hello, Motown, Penny Lover, review, Running With The Night, Stuck On YouBookmark the permalink.